You’re so confused by the title right now, aren’t you? 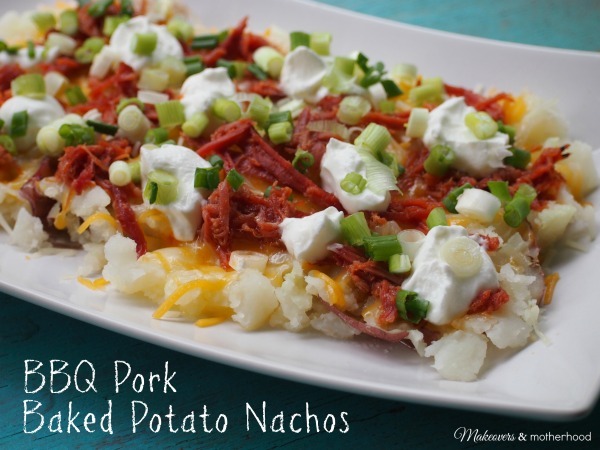 Is it nachos with baked potatoes on it? You’re wondering what is wrong with me. Don’t worry, my hubby thought the same thing when I told him what I was making. Here’s the scoop… as awesome and delicious as nachos are, well darn it, they have lots of calories and carbs and are really easy to over indulge ourselves on. I definitely can’t say I’m a meat and potatoes kinda girl, but lately we’ve been doing baked potatoes as part of our meatless Monday menu. Ironically, I keep the potatoes and the tortilla chips in the same basket. So while reaching to make our family one of our favorites… nachos, I opted for the potatoes instead. It’s real food… ain’t nothing processed on these taters! Portion control. Unless you make more, this is it. And I think the potato substitute makes the nachos even better! It’s rich in flavor and texture and absolutely delicious! Add butter, Mexican cheese, and BBQ pork. Cook for about a minute or until cheese is melted and pork is hot. Add sour cream and sprinkle with green onions. Oh my goodness, they really are yummy! Hope you tried it! I think this is yummy! Nachos are a staple in my home……just last weekend Nate was complaining when we ran out of cheese! That’s awesome! We LOVE nachos too, but I usually eat too much with chips. I really like that this gives me portion control… and it is delicious!! !